For the first time in Super Smash Bros. history, a character from the fighting game series Street Fighter joins the battle. 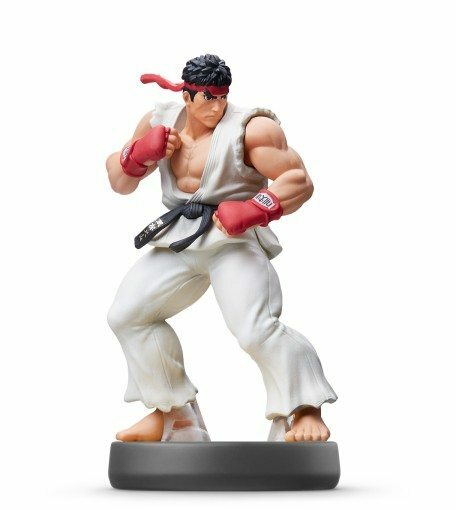 Iconic character Ryu, whose look in the game is based on Street Fighter II, brings a new fighting style and feel to Super Smash Bros. for Nintendo 3DS / Wii U. Ryu’s traditional Light, Medium and Heavy attacks can be used depending on whether players tap, press or hold the buttons. Classic Street Fighter moves like Hadoken and Shoryuken can be activated with just a one-button press, but players who enter the original button combinations from the Street Fighter series will perform the same actions with higher damage. amiibo tap: Nintendo’s Greatest Bits [Read]: Scan your amiibo to unlock a short playable portion from one of 32 include Nintendo Entertainment System (NES) or Super Nintendo Entertainment System (SNES) titles. Captain Toad: Treasure Tracker [Read]: You can scan your amiibo to receive 1-UP Mushrooms. Chibi-Robo! Zip Lash [Read]: Scan your amiibo to earn in-game coins that can be used with the Capsule Toy Machine. Hyrule Warriors [Read]: You can scan your amiibo in once per day to receive a weapon rated 3 stars or lower, a Rupee bonus, or crafting materials. Mario Party 10 [Read]: Tap your amiibo to the Wii U GamePad to play Scratch Bonus and win Mario Party points, letting you unlock in-game bonus content. Nintendo presents: New Style Boutique 2 – Fashion Forward [Read]: Scan your amiibo to invite special guests into your boutique; if you can fulfil their requests, you’ll receive a stylish reward! Super Smash Bros. for Nintendo 3DS [Read-Write]: Customise and train your amiibo as the ultimate sidekick, levelling it up to crush your opponents in Smash mode matches. Fight your amiibo against a friend’s to make them even tougher, while tweaking its attack, defense and speed stats in an effort to help gain the upper hand. Super Smash Bros. for Wii U [Read-Write]: Customise and train your amiibo as the ultimate sidekick, levelling it up to crush your opponents in Smash mode matches. Fight your amiibo against a friend’s to make them even tougher, while tweaking its attack, defense and speed stats in an effort to help gain the upper hand. Yoshi’s Woolly World [Read]: You can use your amiibo to unlock a special Yoshi pattern based on the character.